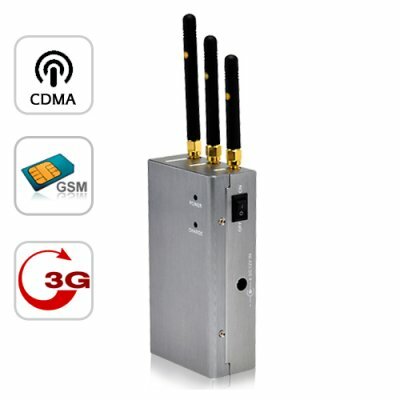 Successfully Added Silencer - Full Spectrum Cellphone Jammer (CDMA + GSM + 3G) to your Shopping Cart. One of the finest cellphone jammers available today, The Silencer effectively shuts down both quad band GSM and 3G cellphone signals - it even disrupts older CDMA mobile phones for silence all around, all the time! The Silencer full spectrum cellphone jammer transmits low power radio signals to cut off communications between cell towers and any cell phones in the proximity. It does not interfere with anything other than mobile phones within a 30 meter working radius! And the instant you turn this jammer off, all cellphones will automatically re-establish communications and provide full service. While you may have seen plenty of mobile phone jammers before, this one is quite simply one of the best we have ever tested in terms of reliability and construction. Brought to you by the China wholesale dropship electronics leaders - Chinavasion. this unit gets very hot,so hot that you cannot hold it.the battery only last around 1 hour!and worst still it takes 5+ hours to charge it not good,china vision say this is normal and contradics everything they state in the listing.they fobbed me off with this answer because they couldnt be bothered dealing with my complaint. on 2010-08-24 22:00:27 The king of mobile JAMMERS! Amazing Chinavasion, keep up good work. Arrived in London 3 days from order. Fantastic. First bought the little shorter range mobile blocker that worked well buth thought I'd try this. Glad I did. This is the beast of mobile blockers. I found can take any phone out in 25-30M radius on train, shopping centre, indoors. Outside I found around 15M which is great as outdoors you don't really notice beyond that. To some up if you want a professional beast, good quality made, good range, of a mobile phone blocker get this. on 2010-07-30 01:23:32 Excellente Product ! ! ! Very good product, i sell this and had buy more than 20 units, all made equal, good battery life, it makes cellphones not work in 10-12mts. Will buy again ! ! ! awsome works just as described fast shipping will deal with this company again!